I just can’t believe this GORGEOUS weather we’ve been having these last couple of weeks! I feel like I’m in the wrong country, haha! I really hope it carries on…sunshine just makes everything so much more fun! I keep hearing rumours that we are going to be in for one of the hottest summers on record? That would be awesome, as long as it will start after I have given birth or else I will just need to move into someone’s pool until baby’s arrival!! I am now 23 weeks, only one more week till “V-Day”! Did you know that babies are now deemed viable at 24 weeks and have a chance of survival? That’s basically what V-Day means. To be honest, yes, I will be relieved to reach V-Day, but I CANNOT wait until the actual B-Day! I am terrified of the whole labour and birth thing, and refuse to watch “One born every minute” because of it. I feel like I am counting down to torture day, and it can’t be avoided! BUT on the flip side, that day will be one of the most exciting of my life! I try to imagine what it will be like to meet our daughter and to get to hold her for the first time. I get so excited, it feels like when I was a little girl, the night before Christmas or my birthday, but times a hundred! That’s quite the statement I know, but it’s completely true. Don’t get me wrong, I have always loved and adored children, but I just never wanted my own. Those of you that know me really well, will know that I used to be THE biggest advocate for living a child-free life! I swore to myself that I would never, ever have children and I made one of my sisters promise that if I ever tell her I am changing my mind, she would have to talk me out of it. Well luckily, she never did, and obviously I changed my view about all this quite some time ago! I can just imagine the concerned look on your face, your inner psychologist trying to come out and diagnose me! I had actually completely forgotten about this until one of my sisters reminded me and asked me about it. Thanks to her, I decided it was time to do some self-assessment and thought why not let you join me. Time to get out your psychologist glasses, worn on the tip of your nose, and make some space for me on the chaise lounge! I think it started way back when…growing up the the 4th oldest in a family, or more appropriately-named a tribe, consisting of 7 girls and 2 boys….it was crazy, chaotic, fun, never boring, adventurous and at times a little overwhelming! Being one of the older ones in such a large family naturally comes with a lot of responsibility. I changed my first nappy when I was 5 and babysat not long after that. During the school holidays I used to put on a “Kids club” to keep the little ones entertained. There was always a guaranteed show for the family at the end of it, which they were forced to endure like it or not! I absolutely loved my siblings to bits but I definitely felt like a mum and by the time I grew up, I was exhausted and in desperate need for some me-time! So I went travelling to Mexico and it was amazing! I ended up living there for a total of two years, and it was just what I needed to finally learn to live care-free, without too much responsibility and people depending on you! Well, there was that reason that I felt like I had already fulfilled my duty as a mum but there were far deeper issues that I needed to face. The main reasons why I didn’t want to have my own kids. Reasons I didn’t want to admit because I didn’t know how I would deal with them once I acknowledged them. I was scared that I wouldn’t be a good enough mum. I was scared that I wouldn’t love my kids as much as I had loved my siblings, and the kids I nannied for. I was scared that I wouldn’t be able to cope with being a mum, that it would all get too much for me and I would end up hurting my kids because of it. Basically, I was scared that I wasn’t going to do my kids justice, and that I wasn’t meant to be a mum. I am sure that there are many of us that have had to face these tough questions, but these fears were SO strong and felt so justified that they became truths that I believed. Paul was my rock, as ALWAYS, and he helped me to start seeing the real truth. He helped me to realise that I had the power to change the future. That just because I had witnessed and experienced certain things, I didn’t have to follow the same patterns. I wasn’t alone, we were a team, and together we would help each other and remind each other that it was up to us to choose the destiny we wanted. Little by little, I realised Paul was right. As I watched families and friends that inspired me, I saw that they too had to make the same choices – whether they realised it or not. Once I started to let the real truth sink in, my walls that I had built up around me to “protect me from facing reality” started to come crumbling down. My heart was free to choose to love without fear. So now, when parents come up to me and say , “Enjoy your last few months on your own, you won’t sleep again”, or “It is sooooooo tough”, or “You will never stop worrying from here-on in”…I just smile at them politely. Sure, I can appreciate that it won’t always be easy, but Paul and I are about to given the most precious gift and we won’t let anyone take away our joy! These kinds of comments just remind me of the time before Paul and I got married and people would tell us things like, “You will loose your freedom forever”, “Get out while you can..hahaha” It used to really get to me, but I can assure you that it has been the BEST THING I have ever done! Now, I am not having a dig at “those people”, I can understand that they mean well and just want me to be prepared. I get that. Let’s just try not to take life for granted – our understanding partners, your beautiful children, that upcoming holiday, those incredible friends! Yes, life has its ups and downs, but you get what you focus on, and I, for one, am going to focus on all the amazing things in life! There. I’m done. You can take the chaise lounge back 🙂 I hope this helps someone else which is why I shared it, and I hope my sister (it’s all your fault! Hehe) appreciates this very, detailed answer! Yes, I am still alive and well….I am sorry for my absence and I promise to make it up to you in this blog entry! Better grab yourself a drink and a biscuit (cheeky!) and sit back for a looooong read! The last time I wrote, I was at 16 weeks, I am now 22 weeks! Time to give you all another non-fruit comparison I think! Week 16 | Avocado | Ok, I’ll admit this is getting a bit harder to do now! Uh, let’s say the length of my pointy finger just loads fatter!! Week 17 | Orange | Gosh, I’m really struggling to think of objects! Here’s a random one, simply because he’s lying right in front of me…Beck’s (our house rabbit) head!!! Week 21 | Cantaloupe (Net Melon) | Um, the height of a box of Ritz crackers with the flaps open all the way?? Lol…can’t think of anything other than Ritz now! Week 22 – 24 | Aubergine | 10 Ritz biscuits in a row? Haha, just messing now… How about the length of a 30cm ruler! That’s pretty long! So one of the reasons I have been a bit quiet on the blog-side of things is because I was on holiday, yay! One of my best friends and his girlfriend, came over from the States. My friend was flying over to photograph a wedding here, so we decided he should make a holiday out of it. It was the girlfriend’s first time on this side of the world so we decided we will pack in as much as we can and make it a trip to remember! We spent the first few days in London, seeing the sights and shopping in Topshop (which is a must for every American apparently!). The weather wasn’t very kind to us, it rained pretty much for the entirety of the trip and it was freezing, but we were troopers and let nothing stop us! After my friend finished shooting the wedding and we had explored London enough, we drove to Scotland! We stayed in this gorgeous little B&B by the seaside in Ayr. The weather was still horrific, but at least we were expecting it going to Scotland! We spend three days there, exploring a local castle, getting a ferry across to the Isle of Arran and spending the day there. That was a super fun day! We just hired a car and drove around the island stopping here and there to explore more castles, check out a whiskey distillery, take loads of photos and to find the mysterious King’s Caves. Now, that’s a story! We thought we would just be able to park up and the caves would be right in front of us, staring us in the face, ready to be photographed to death. No. That did not happen! We ended up having to hike there! A local told us it was a really easy trek and would take about an hour, and upon telling him I was 4 months pregnant he was like, “Oh you’ll be fine, there are only a few steep bits”. So we set off, the sunshine on our side, brimming with optimism and munching on some trailmix (a stereotypical American road-trip snack that consists of nuts mixed with chocolates, like M&M’s, and sometimes raisins…it’s really yummy actually, I was going to start making my own, I need to get on it!) We soon realised this local had no real sense of reality and was a LOT fitter than he looked! The path was getting steeper and narrower, and at points were were sliding down muddy cliff sides, holding onto the sides for dear life! Eventually we arrived at the caves, they were amazing and did make the hike worth it. They were right on the beach, and had all sorts of carvings on them. Very interesting. When we left the caves to carry on the path which would take us back to the car, we saw the sky darkening in the distance and it was coming straight towards us! We were walking along the cliff side, when suddenly the storm hit and we were bombarded by hail stones, icy wind and rain!!! Needless to say, we pretty much ran to get out of the open space to get some cover and the storm eventually passed, phew! After speed-walking for about an hour and a half we made it back. We looked at the map in the car park and it turns out we had walked 5k!!! After an adventurous time in Scotland, we weren’t quite done. We had quite a dangerous journey back to England, getting stuck in a snow storm in the mountains, and then finding ourselves on the motorway during a severe weather warning, advising people to stay at home! It called for a day of rest, especially for my hero of a husband who had done all the driving! However, that same evening, we were off again…this time to…Paris!! My friend and his girlfriend really wanted to be spend Valentines Day in Paris, so we thought why not?! We had left it too late to get a decent price on Eurostar tickets, and we weren’t going to drive again, so our only option was to get a 9-hour coach ride. It was overnight, and pretty brutal! None of us got much sleep! Once we got to Paris, we were on a busy schedule as we were used to by now. We spent all day seeing the sights, in the rain, and then finished our time at the Eiffel Tower doing photoshoots. I really wanted a maternity shoot, but at that time I had only just about “popped” and my bump was still quite small, so I just stuck it out a bit more and I think the baguette I had for lunch helped with some extra bloating! Haha. That evening we got the coach back to London, another extremely uncomfortable journey, and arrived in London at 4.30am. Then, we went home and slept for 3 days….not! Yeah, that would have been the sensible option but we did the opposite! We had decided to stay in London for that morning so that we could squeeze one more shopping trip in. My friend is obsessed with Ben Sherman and we didn’t have the chance to go any other time. So we waited until 5.30am for the tube lines to open, went back to our car, got changed, and went for breakfast in Soho, as you do. We didn’t realise what a gem we had found, being one of the first customers there, until this massive line of people started forming outside the restaurant waiting for tables!!! It was an amazing breakfast, but to queue up in the freezing cold is quite dedicated! After clearing out Ben Sherman, we were finally homeward bound, but we could barely drag ourselves back to the car. Again, Paul was the hero driving us back while we were all snoring our heads off! – I am not allowed to sleep on my back, so I don’t squash my organs and restrict my breathing, I think. So they say you should try and sleep on your left side. That’s easier said than done! I think I need to invest in a maternity pillow soon that will wedge me in so that I can’t roll over! – I can’t carry heavy shopping and manage four flights of stairs anymore! Just simply walking up the stairs gets me majorly out of breath! Apparently my walk has changed too, the boys at work have kindly informed me. Not yet a waddle, but it has significantly slowed! – I can’t get out of Paul’s car without assistance! Before you laugh too hard, his car is kind of like a sports car in that it’s really low and the seats are super low, so once I’m in, I can’t pull myself out anymore :0 At least it makes Paul look like a proper gentleman, opening the door for me and yanking me out! Lol. Ooh, I need to tell you about our 20-week Anomaly scan! That was fun! This time the scan was longer than the last time, as they need to thoroughly check that there aren’t any anomalies and that the baby is looking healthy and its heart beat is regular, etc. The detail we were able to see was incredible! You could see each single rib! The heart was really clear too, and you could clearly see it beating. Paul and I both wanted to know the gender of the baby, so we asked the Sonographer to write the result in a card for us. I wanted it to be bit more special than them just blurting it out. So the plan was to go for a coffee after and open the card together (and I would cry guaranteed!) 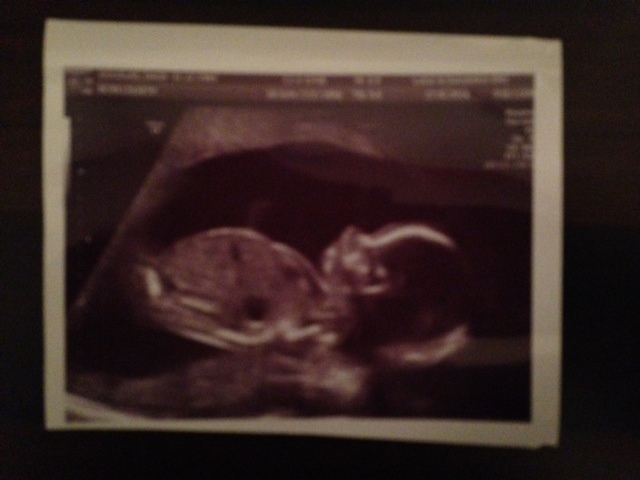 So, in the scan, the Sonographer quickly looked between the legs but swiftly moved on and didn’t really comment. The baby was a lot more temperamental than last time. It was wriggling around and moving its arm and kicking out its legs. At one point it look directly at us, it was sooooo cute!!! After an amazing scan, and being informed that the baby was healthy, we went off for coffee, card in hand. Now, I will tell you that up until this point I was convinced I knew what we were having…a boy. I had dreams, and just thought I had this sense. I was so adamant I was right, I almost went out and bought blue things! Paul was the realist again, and he didn’t let me influence him! 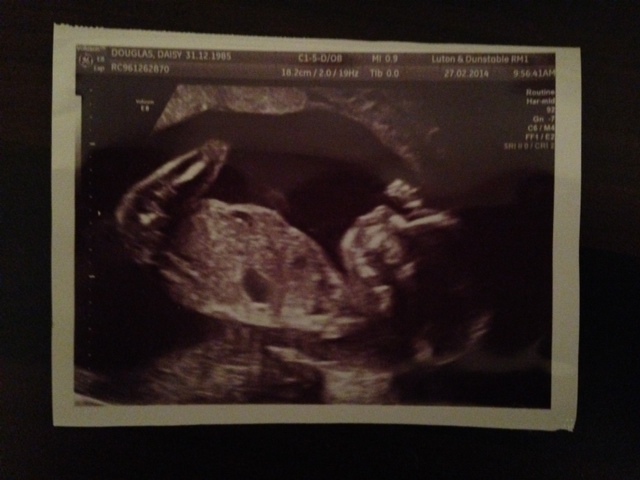 Here is Baby Douglas in mid leg kick, hand to her head! During the scan I found out that I had an anterior placenta, which means that the placenta lies in front of the baby, just behind my bump. This doesn’t cause any complications, but it meant that feeling her kick would take a little longer. From about 20 weeks I could feel little flutters here and there, and it has been steadily getting stronger. It’s a really strange sensation and hard to explain, but at the moment it just feels like little pulses. At first, you’re not even sure if it’s the baby or just wind, or indigestion!!! It’s the sweetest thing, knowing she is kicking away in there and I couldn’t wait for Paul to get to feel it too! Then, finally, at 21 weeks, Paul and I were cuddling on the couch and he put his hand on my bump. As soon as he did, she started moving around and all of a sudden there was a strong kick! Paul moved his hand, as he couldn’t feel anything, and we just watched my tummy and sure enough, another strong kick and you could see my bump moving!!!! It was so crazy!!! Paul put his hand back over the bump and he got to feel it, and have his first encounter with his little daughter 🙂 It was an absolutely priceless moment. He had no idea that you could actually see the bump move, you should have seen his face! It was similar to my face when we found out we were having a girl! Hahaha. Bump status update: Well, as you know I finally “popped” at around 17/18 weeks and since then the bump has not stopped growing! It was still fairly neat at 20 weeks, but I feel that it has doubled already since then! I am definitely starting to turn into Shamu, especially if this doubling thing carries on! 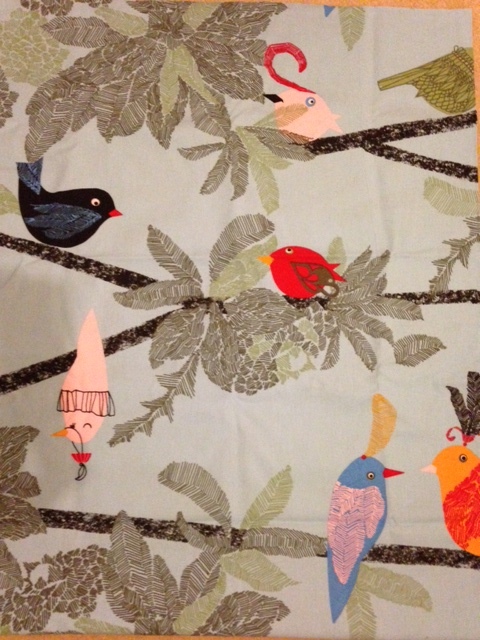 Let’s hope Baby Douglas likes birds as much as me! Our friends and family have been SO incredibly generous and have given us quite a bit of stuff already! So we don’t really have too much to buy, which is great. There’s something special about having a baby, because as they say, “they bring their own blessing” and she certainly has! I think it’s very easy to get really panicky about things that still need to be organised, and preparing for something that you have never experienced, but then you get to enjoy all these little blessings along the way, and it’s like God’s way of saying, “Just breathe, calm down and enjoy the journey. Everything will be taken care of in due time.” Amazing huh?